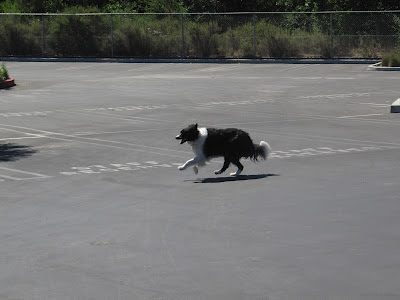 Byron and I decided to take Betzi down to the local elementary school that's out for summer vacation and let Betzi have a good run. I hooked up Betzi's trailer to Byron's ride of choice for the day. 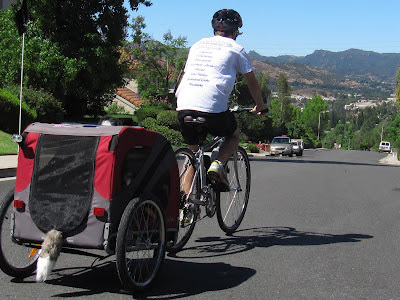 He'll take his Catrike 700 next time because the ride up our hill is tough on a traditional bike...he walked it up. The hill we live on is the steepest one in our city of Agoura Hills. A guy...no helmet.. recently died while going 80mph down our hill on two wheeled scooter type thing. I'm guilty of going over 50mph. 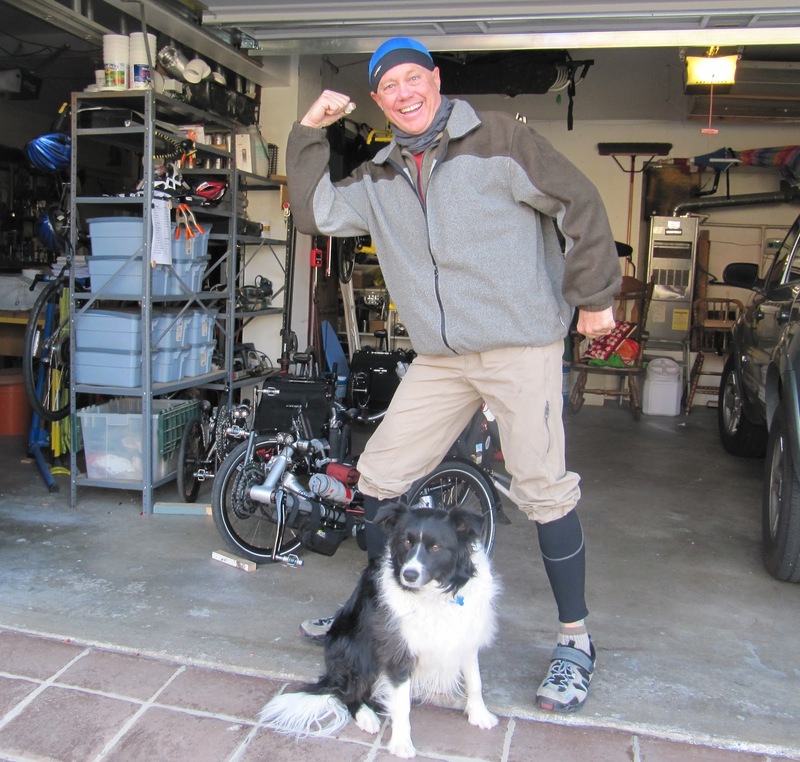 Coming back up is a sub 3mph grind that I take three times a week. Don't worry, that's not Betzi's tail sticking out. I though a fake tail sticking out might be another way to get attention while riding laid back a few inches off the pavement. That's my boy charged with the burden of towing 90lbs of dog and trailer. Once the ole girl gets going she runs beside me...she's fast! Does this mean that we actually exist?!! 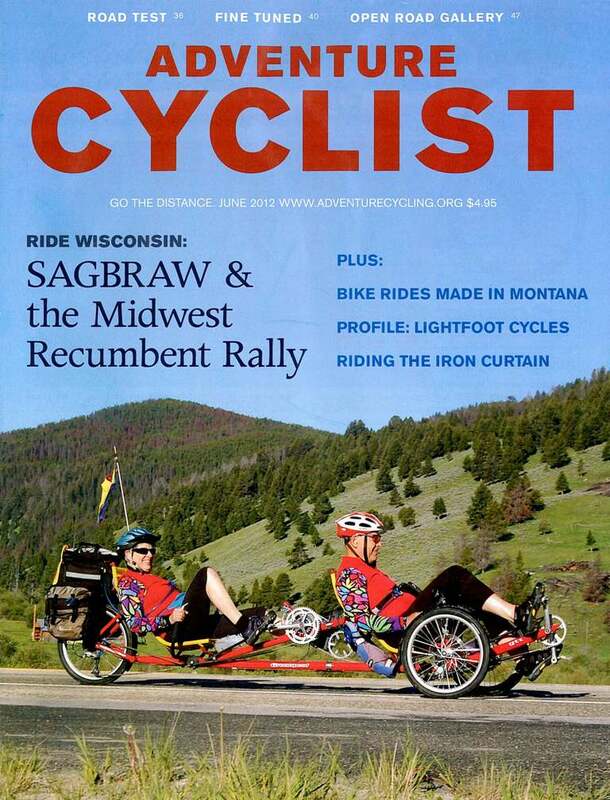 Adventure Cycling has run a small hand full of articles on recumbent cycling over the years. In my humble opinion the past mention of laid-back cycling was less then adequate. 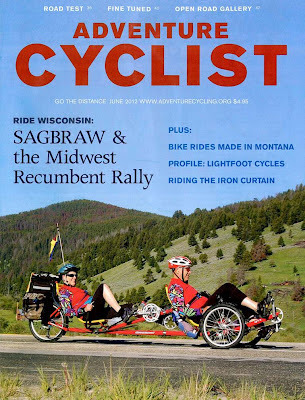 The latest issue of Adventure Cyclist finally recognizes that there is a viable alternative to cycling that doesn't require the rider to jam a wedge of leather (or vinyl) up his or her rear end. 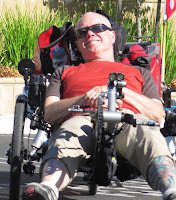 I've been riding recumbent trikes since July of 2009, I've definitely settled into the type of riding I like. 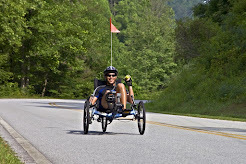 Being new to recumbents in 2009 ago and not having cycled for some years before that I really wasn't sure what kind of riding I would enjoy. 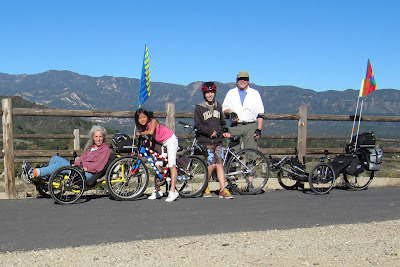 The qualities that I've enjoyed about hiking for so many years seem to be the same that I enjoy when riding my trikes. First and foremost I like to go at an easy (not necessarily slow) pace and be free to make changes at the last minute. I like to stop and "smell the roses" and I don't like time constraints which means I usually ride alone. I consider myself a tourist when I ride, looking around and taking an occasional picture. Although I have transgressed a few times and opted for speed as when I ride my 700. 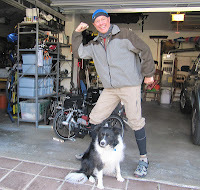 For the most part I have settled into a comfortable rhythm riding my Expedition loaded down with creature comforts and usually towing my K9 buddy, Betzi. 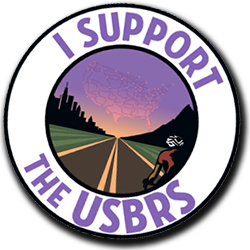 I have no problem riding on the roads, 90% of my riding is on roads, but I will always opt for a bike path when available. Even a crowded MUP (multi-use path) is better then a busy highway. The only goal I set for myself is to experience people and places and pass those experiences onto my kids and anyone else who chooses to listen...therefore I Blog. I just picked up a Dahon folder that I found on Craigslist. 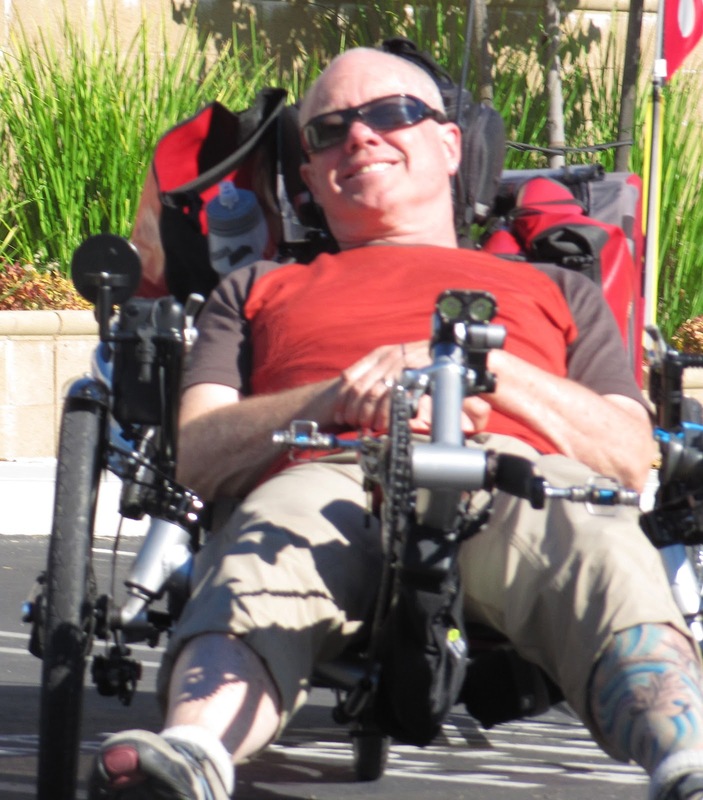 Why would a committed recumbent triker buy a a two wheeled upright folder? 1. 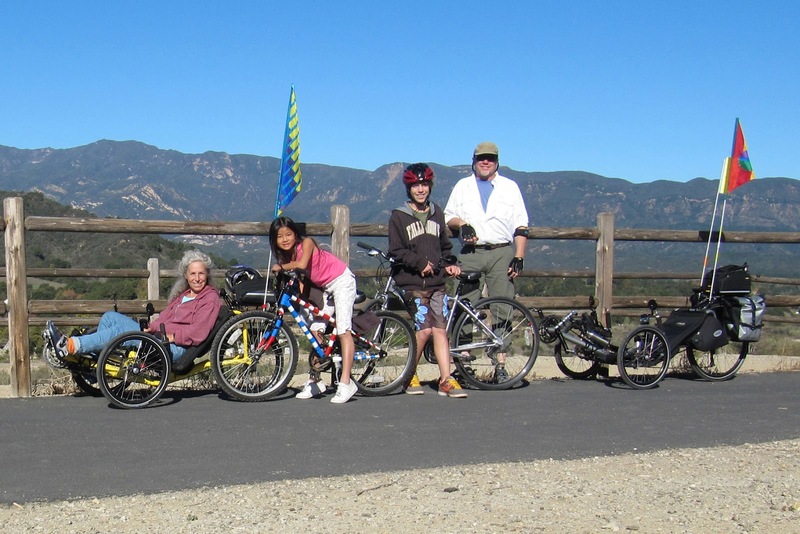 It's easy to throw in or on top of the car for family vacations where it would be nice to take some short rides. 2. It's not just for me, it can adjust for anyone in the family. 3. Leili grew up fast and doesn't have her Dash Catrike anymore so the folder can be her ride on family rides. 4. Super easy to fold and unfold. I took it on a little ride and it handles good a feels smooth. 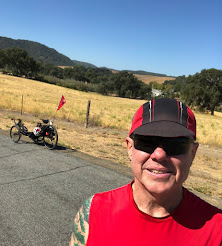 Riding it also reminded me why I ride a recumbent. It's going to be a fun bike to have around, especially at the beach. It won't be seeing a lot of mileage, at least with me on it, but it has a purpose...fun! 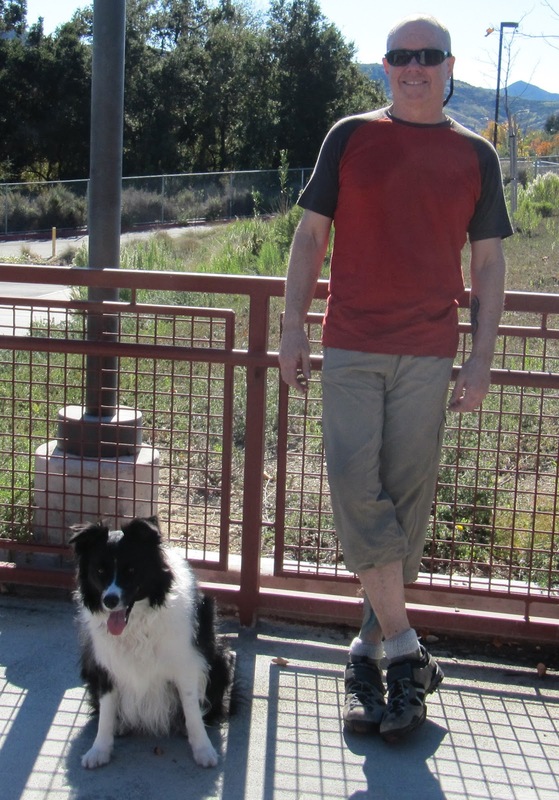 This is an older pedestrian bridge over a water channel that I came upon a few weeks ago. The posts are to close together for me to get my trike through. Okay so they weren't thinking of trikes back in the day but you can't even get a full sized baby stroller through these closely spaced posts. The posts are about 27 inches apart. It's time to send off a letter to the illustrious city officials who are restricting the passage of anything or one over 27 inches wide.